Guitar legend Jeff Beck honours former mentor Les Paul with an intimate tribute show in New York. 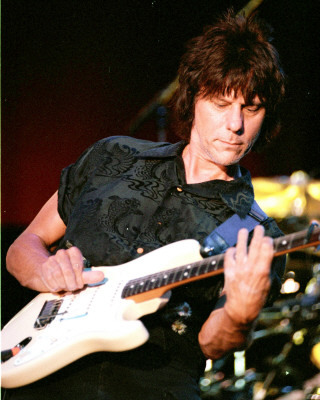 Jeff Beck honoured his mentor and friend Les Paul, one of the inventors of the electric guitar, with a special 3-night performance at the Iridium Jazz Club in New York where Paul played every Monday night until his death. Thursday (June 9) would have been Paul's 95th birthday. Beck, a two time Rock and Roll Hall of Fame inductee, said he could not think of a better way to pay tribute to the man he admired since he was a young boy. "As a child I started being inquisitive. I just remember being smitten by the sound. This vibrant fast playing and the echo I think is what did it. I went through teenage years and started to buy records by him and then had the great fortune to meet him as well, which was like meeting the Queen or the King or something." As Beck recalled personal memories of Paul he joked that his mentor was naughty and impish, but a genius. He said performing some of Paul's songs was a tremendous challenge because he couldn't make them sound quite like Paul would have. In all, Beck played a total of 27 songs and changed guitars five times throughout the evening's performance in order to capture the right tone. In addition to developing the solid-body electric guitar Paul also created recording innovations like overdubbing and multi-track recording. He sold millions of albums and became a fixture in the New York city music scene. He died in August 2009 of pneumonia. Beck announced the dedication of a Les Paul Room at the Iridium to acknowledge his contributions to music history and to New York City.